Waist Trainer Buying Guide: Do Waist Trainers Work? There's been a lot of buzz in the celebrity world recently about waist trainers. Famous actresses and models are posing in Instagram photos showing them on. But what exactly are waist trainers? The term “waist training” usually refers to the use of steel boned corsets on your waist to develop an hourglass shape. The practice was popular centuries ago. It is important to note that the results are not permanent. Constant upkeep is necessary to maintain your shape. 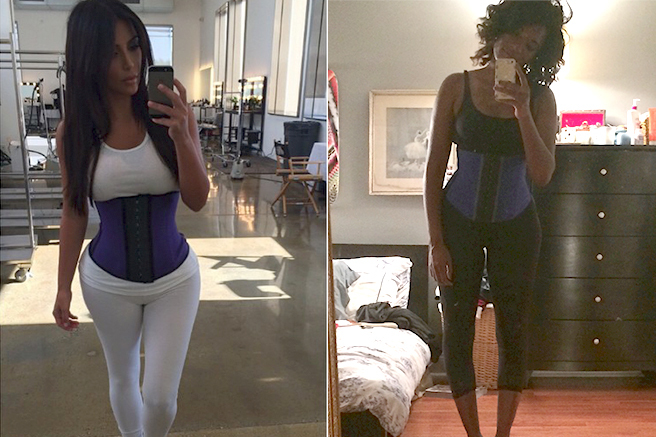 Celebrities including Amber Rose and Kim Kardashian have made modern waist trainers popular. They can stay on during workouts with latex waist cinchers, which you can view below. It should also be noted that the achieved result is only semi-permanent. This means you need to continue to use the waist trainer on a regular basis if you want to keep the shape. It really should be referred to as waist taming. This can be integrated as part of a woman’s workout regiment. So What is Waist Training? Waist training as mentioned above is essentially the process of using a steel boned corset to shape your waist like an hourglass. It will yield results that are semi-permanent. The figure is made by moving your ribs and reducing space in your abdomen. Women wear it for fashion reasons or help their posture and back with certain clothing. The waist trainer does not do anything itself to help you lose weight, but does function as an external LAP band. The latex waist trainers you see that has been popularized by celebrities like Kim Kardashian is known as waist taming.Women also choose body shaper belts, which can be better for everyday wear. Waist training is not dangerous, so long as you know your body and use common sense practices. Don't spend crazy amounts of money on trying to look thinner, try this waist trainer – fat burner combo pack for $37! If the corset is causing you pain, you should take it off or at least loosen it. It is prudent to break the waist trainer in slowly, allowing your body to get used to it. What Results Can You Expect From Waist Training? The results differ for everyone. No two people will get the same exact results. Genetics can also play an integral role. How long each day do you wear a waist trainer? Are you dieting and exercising? How many days a week are you wearing your waist trainer? How tight is your waist trainer? Here are a list of actual waist training stories which will give you insight on how it has worked out for real women. These women have had success in losing inches from their waist by wearing a steel boned corset over the course of several hours for several days a week over the course of a number of weeks. Prescod begins her waist training on the first day of New York Fashion Week. This means she will only be seated during shows and/or while in transit to shows. Prescod notes that it was 90 degrees on this day and was basically running a marathon throughout the day. It was a very stressful day for her. She didn’t want to work out, as she loathes it. She removed the waist trainer after 12 hours. Prescod is more prepared mentally on day two. She takes her cue from Kim Kardashian, noting that if the famous television icon can do it, she can too. Prescod notes the waist trainer feels looser. She reaches out to the people at HourglassAngel.com to ensure her Ann Chery corset was not stretched out in any way. It was not. Prescod is pleased that is working. Prescod begins to realize wearing the waist trainer gives her a bad attitude and makes her very irritable. She even is sending very mean emails and is abruptly walking away from conversations. Prescod is skipping meals and is finding herself to be very hungry. Prescod declares herself addicted to her corset three weeks in. She says she see good results and wants to see how long she can go. Still, she has not worked out at all, nor has she changed her diet, except for the meals she cannot eat because of the changes in her body. She checks in with the people at HourglassAngel. Their team advises her to exercise on a regular basis, but Prescod ignore them. She wants a smaller corset. Prescod notes her high tolerance of pain having been a ballet dancer. Prescod notes that she was still irritable, but looked good. This is inspite of not working out at all. Still, she knew that it would ultimately need to change. Prescod laments her muscles atrophying to HourglassAngel.com. She cannot even lift her feet while going for a pedicure. While they were nice about it, they did advise strongly to exercise. Prescod went to Matt Griffin, a personal trainer who is based at David Barton Gym. Griffin works as a costume designer on a part-time basis and used to be a dancer. Prescod realized very quickly into her first session with Griffin that her ab muscles were virtually non-existent. She realizes that she should have built up her core before starting waist training. To improve her core, Griffin had Prescod do planks along with crunches with weights, side twists and some leg lifts. He told her to do these exercises three times over the course of a week. This is because he doesn’t want her body to have a permanent, flabby appearance. Prescod put the waist trainer on once again after three weeks without it. She says she feels good, despite being advised against putting the corset on again. Prescod continues to do her exercises.